You must pass a test to get a driver's license. But you can get on skis or snowboard and run amuck on the slopes. Go figure. Here some rules for the road - snowstyle, to keep you sliding smooth. ~ Choose carefully where you put your gear on in the morning. No one wants to navigate a series of skis when entering the chairlift. Go off to the side to buckle boots, etc. ~ Be polite when entering the lift line. Be ready to show the ticket checker your ticket. Don't keep those behind waiting while you fish out your ticket under a pile of clothing. ~ Unload the chair and move out of the way. Buckle boots, etc. off to the side. ~ Look before you leap. Look up the hill. Look to the left and to the right. Wait until you have a clear shot before taking off. Skiers and riders uphill have the right of way. Don't cut them off. ~ Ski or ride in a consistent fall line. Don't zig-zag across the slope erratically. Those behind you won't know which way you are going. ~ If you stop mid hill, pull off to the side. Don't park it in the middle of the run. Big groups should meet at the lift, not in the middle of a run. ~ If you have small children, run interference. Keep your eyes out for fast skiers and boarders and carve some wide arcs around your child. 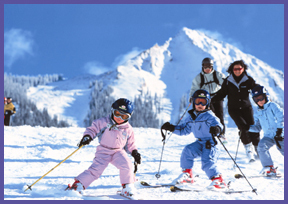 Have your child follow you; they tend to ski erratically when they are out in front. ~ Slow down before crossing another trail. Slow down when entering the lift line. ~ When entering a lift line, wait for your partner before getting in line. No one wants to navigate around you as you just stand there. ~ When riding a chair with other people, use common sense and civility. ~ Remember that it's all about having fun. Keep the shouting, insults, whining and other negativity at home. Smile!